Southeast of Grenoble the D1091 climbs quickly into the forest of Rioupéroux, on the western slopes of the French Alps. 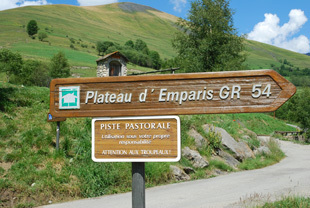 Called alternately the Route de l’Oisans or the Route des Alpes, the road is a notorious feature of the Tour du France and – as any avid cyclist will tell you – a real bugger to ride. As we navigate the switchbacks in our rental car, grey stone towns give way to vast green meadows that sweep the sun-drenched slopes. Up there, the air through our open windows smelled of cut grass and damp earth and alpine flowers, while towering clouds punctuated the deep blue skies and lent coolness to the waves of heat. The kids got restless while we muddled over that perfect picnic spot, so we crammed them with crusty baguette sandwiches from the back of the cars in a hurried bit of frenzy. A little later and a lot more calmly, we found a place off the side of a side road, with a creek for the kids to explore and a trail that led adventurously into the high slopes nearby. This is what always amazes me in Europe: you go hightailing off into what seems like the wilderness and there, on the edge of the world, is a tiny outpost that’s been there for hundreds of years. As my nephew and I climbed up into a scrub of trees, we peered at this cluster of stone houses. Almost to the crags of the highest peaks they were, set down like part of the mountain itself, huddled tightly together. Around them was greenery, but with only a few gnarled trees. As far as we could tell, they were about as exposed on that mountain as any dwellings could get. 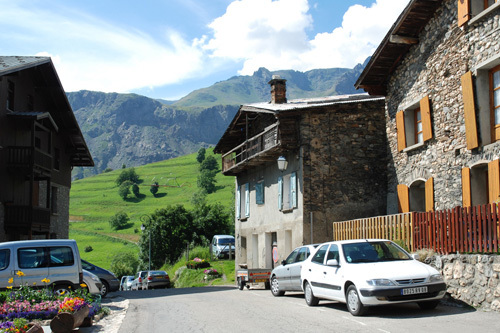 Back down into relative civilization, we stretched our legs in the picturesque village of Besse (population 139). At the far edge of town, we bought bread from La Boulangerie la Tourte de Besse, where the baker tended his woodfired ovens in a small stone chalet. Around us, as far as the eye could see, were alpine vistas that stretched to the sky. It was all breathtakingly beautiful. Later, as the kids splashed in the pool, we sat around the table and took in the night. That bread, with its smoky crust, delicately chewy insides and sweet tang of grains – older than the oven it came from – was good for the soul. In its flavors I tasted long snowy winters and hard living mingled with the freshness of green meadows and crisp alpine air. Here in Seattle, I break it out occasionally to take me back. Here’s my recipe for connecting with the ancients. Make the starter: In a large bread bowl, mix 10 ounces flour, 8 ounces warm water and 1¼ teaspoon active dry yeast together. Cover and set at room temperature for 12 hours, until it is frothy with bubbles. Stir down before using. Make the dough: Using kitchen scissors or a sharp knife, cut the starter into 10 pieces and douse with a cup of water to separate the pieces. Add spelt flour, rye flour, flax seed, 3¾ cups of the all-purpose flour and salt. Pour on the other 2 cups of water and mix with the handle of a wooden spoon until sticky. Cover and let sit for 30 minutes before kneading. Kneading and first rise: Turn out onto a well-floured work surface and knead for 10 minutes, until the dough is soft and relatively smooth. Add more flour as necessary. Clean and dry the bowl and return the dough to it. Cover and let rise for 5-6 hours in a cool place (60° if possible). 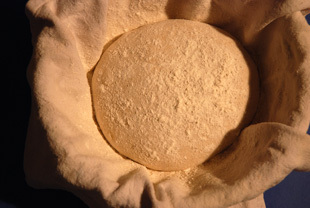 Second rise: Move dough to a room temperature environment (68°). Punch down, and let rise for a further 3-4 hours. Prepare your woodfired oven: Build a moderate fire and maintain it for 2 hours, until some of the carbon on the inside walls has turned white. Move the fire around in the last hour to heat the floor where your loaves will be. In the last 20 minutes, move the fire to the back and sweep the floor well. By the time your bread goes in, you should have a good bed of coals and very little active flame. Prepare your conventional oven: Line an oven rack with quarry tiles or a pizza stone and set it at the middle height of your oven. Preheat your oven to 425° for at least 30 minutes before putting in the bread. Shape the loaves: Turn the dough out onto a floured surface and cut into three equal pieces. Flatten gently to push out most of the large bubbles and fold the corners over to stretch the skin that will be the top of each loaf. Turn over each piece and tuck the bottoms under to make a ball. Flour 3 cloth napkins fitted into baskets, put a ball of dough on each, cover with the corners of the napkins and let rise for 1½ hours in a warm place. When ready to bake, put loaves onto a lightly floured peel or the back of a cookie sheet and slash a design into the top, if desired. Baking in a woodfired oven: Slip the loaves into the oven about 12” from the coals in a semi-circle. Turn the loaves around after 20 minutes; ¼ turn after another 20 minutes; and all the way around again after another 10 minutes. Loaves will be done after 1 hour altogether. Baking in a conventional oven: Slip loaves two at a time onto the quarry tiles (you will need to hold one loaf for later or reduce the recipe accordingly to make 2 loaves). Bake at 425° for 15 minutes. Lower temperature to 350° and bake for another 40 minutes, turning the loaves around once. Loaves will be baked in 55 minutes. Cool on racks for 1 hour before digging in. With some good hearty soup and a hunk of sharp cheese, you’ll have a meal worthy of the ancients. The roaring fire is up to you…. Enjoy! Mmm…! Another winner here. My neighbors vacation in the Alps nearly every year and the photos, like yours, are so “real” that I almost feel like I can step into them. Incredibly rich colors. Spelt is one of my favorite grains and I can imagine just how tempting this bread would be with a nice slather or slice of cheese… Wow! When I was in San Francisco we went to a bakery where the oven was 150 years old. Pretty amazing. Love the bread Don. I can imagine it slathered with butter right about now. I really want to try this loaf! I am slowly, but surely, getting the hang of bread baking … getting the oven (conventional one here in the grey cottage) hot enough is a challenge… can you please tell me about tiles for the oven to build and maintain the heat? Where do I get them … hints etc. If you’ve already posted on this topic, just shoot me the link … pretty please? Ahhh… yes I have a love affair with Europe… These loaves take me back to my family in Germany, and although my boyfriend bakes a different sort of loaf in Norway, bread is still a staple of diet in Europe in a way it is not here. These look amazing, and are definitely going on my list to make on this rainy weekend! Your post took me back to another country and back in time. I have noted the recipe for our next snow day (it’s coming). The gorgeous bread will keep Father Winter at bay. Wow that bread looks gorgeous! Nice when good food takes you back to good memories. Wow! This bread looks amazing! I am always intimidated by old bread recipes! I need to give this one a try. Europe is a magical place. Every time I visit, there is something there to amaze me. 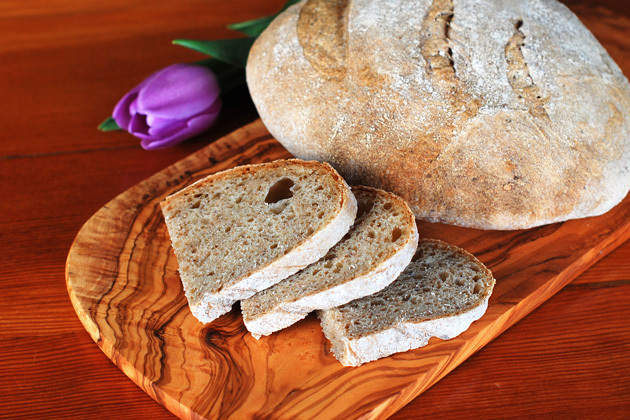 I love homemade bread and your loaves look so yummy good! Yum! I made a similar loaf last night! I’ve made this bread twice now, and I think the recipe calls for a little too much water. The second time I reduced the water and it worked very well. Either way, flavor was wonderful.